Life can be full of frustration, disappointment, and loss. If we are not careful we may respond to life through a lens of fear where our emotions manifest into anxiety, resentment, or negativity. Guard your hearts against such things. 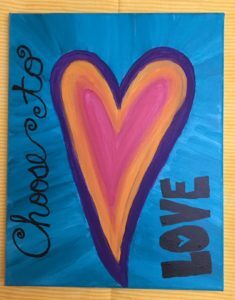 Choose love. Choose to see the good in people. Choose to magnify each other’s strengths. Choose to forgive. Be the reason someone smiles today. When we respond from a place of love rather than fear we can evolve into the best version of ourselves. Choose to love yourself and others. Those who are hardest to love need love the most, including ourselves.